In the heart of Wirral, Cheshire. Welcome to Neston Company of Archers, a friendly and enthusiastic group of archers. The Club is affiliated to Archery GB and shooting takes place under their rules. Archers shooting Recurve, Compound, Barebow or Longbow are all welcome at the Club. Nestling amongst the Ocean Field near Thornton Hough Wirral on Wirral RUFC grounds, are the outdoor shooting grounds of Neston Company of Archers. The Club also shoot indoors at Ellesmere Port Catholic High School during the winter season. The main shooting field is set out for a range of distances to suit all shooting abilities. The main shooting area in undertaken on the winter training grounds of the Wirral RUFC and we also host on the Ocean Fields 20 acres, Cheshire Archery Association and English Archery Federation shoots, during the course of the summer season. 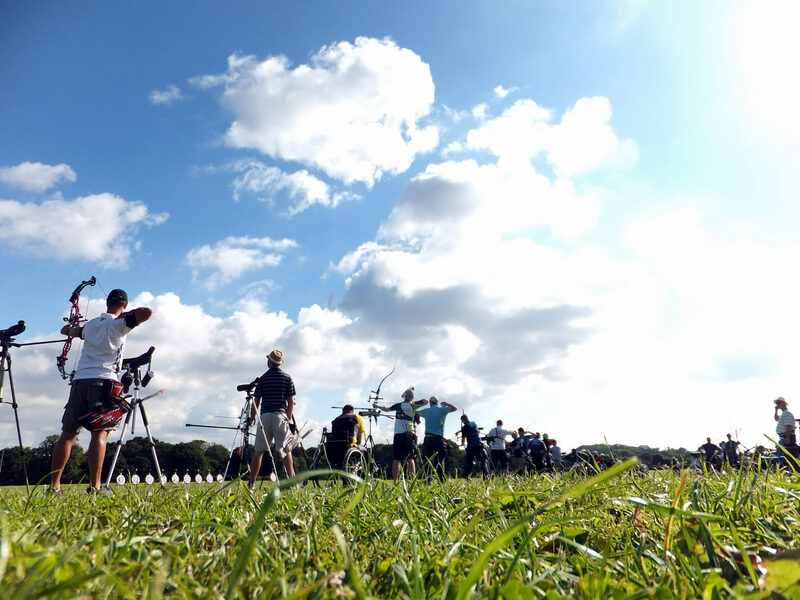 The first weekend in August sees archers from all over the country attending the Cheshire Weekend for Target archery, whilst we also host 4 days of Clout shooting 1 day in May, and 3 days on the August Bank holiday including the Cheshire and English Archery Clout Championships. Neston Company of Archers is a member of “OnTarget”, Archery GB’s Club Development Programme. Clubs joining onTarget are making a public pledge to be open and friendly, to advance archery and to proactively work with Archery GB. We welcome all ages and abilities, our coaching team work very hard to help everyone. Whether you’re a beginner, on the Olympic Team, taking the sport very seriously or just looking to relax after work the coaches will help you get what you want from the sport. In Neston’s formal sessions Target archery is practiced, and our beginners courses will be taught this discipline . Target archery is a popular form of archery, where members shoot at stationary targets usually at distances from 20 to 90 meters (FITA rounds) or 20 yards to 100 yards (Imperial rounds). There are four types of bows commonly used – bare bow longbow, recurve or compound. Archers are divided into seniors and juniors, with juniors being under the age of 18. The year is split into two season, the Outdoor season (Easter – October generally) and the Winter season (indoors) (October – March). Clout is a form of archery in which archers shoot arrows at a flag (Clout) scoring points depending on how close each arrow lands to the flag. The scoring zones are defined by a set radii from the flag pole, with each arrow scoring points similar to the rings of target archery depending on which scoring zone it lands in. There are also members of Neston who take part in Field Archery which involves shooting at targets of varying (and often unmarked) distance, often in woodland and rough terrain. Field archery endeavours to improve the techniques and abilities required for bow hunting in a more realistic outdoor setting. This form of archery is carried out over unknown distances teaching you to shoot uphill, downhill and judge distances, often across rough terrain. Field Archery is usually shot according to either IFAA (International Field Archery Association) rules or to FITA (Federation International de Tir a L'Arc) rules. FITA rounds consist of 24 targets, which may have marked or unmarked distances depending on the specific type of round. FITA Field Archery is very popular in Western Europe. The difference between recurve and other bows is that the string touches a section of the limb when the bow is strung. It employs advanced technologies and materials. The limbs are usually made from multiple layers of fiberglass, carbon and/or wood on a core of carbon foam or wood. The limbs attach to a riser (the centre section of the bow) which is generally separate and can be constructed from wood, carbon, aluminium alloy or magnesium alloy. The term 'riser' is used because, in a one-piece bow, the centre section rises from the limbs in a taper to spread the stress. Several manufacturers produce risers made of carbon fibre (with metal fittings) or aluminium with carbon fibre. The greater mass of a modern bow is in itself an aid to stability, and therefore to accuracy. The recurve bow is commonly used by archers in the Olympics and many other competitive events. An archer can add a number of gadgets to the recurve bow to aid the shot, from stabilisers screwed to the front, a pressure button to smooth the line of the arrow, a sight to assist aim and a “clicker” to ensure each arrow is draw to the same length to ensure consistency of shot. Not as complicated as a compound bow in many respects but as it is split down into its constitute parts it often takes longer to assemble and take apart. The latest evolution, is the compound bow. 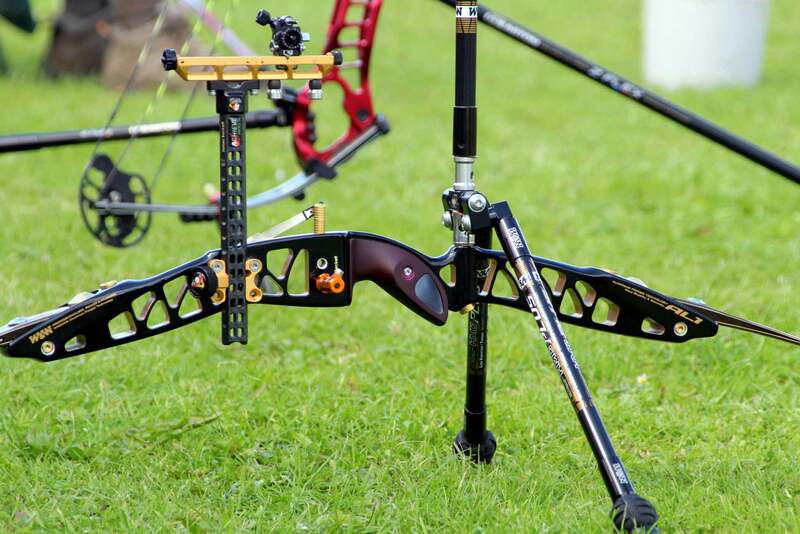 The main difference between compound and recurve bows is that the limbs are compressed by cams, which provide a reduction in holding weight whilst at full draw. This allows for longer holding times. This, combined with a magnifying scope and a release aid (mechanical trigger) makes compounds the most accurate of all bow styles, also providing the highest arrow speeds. As well as being very exciting to shoot, they can also be a lot of fun! Compound bows have been around since the 1960's, gaining huge popularity over the past decade, and are just as a familiar sight now as recurves. Compounds feature heavily in local, National and International competition and are the biggest growth market of bowstyle. So if you like your gadgets and technology, and want to be as accurate as possible, then a compound could be just the bow for you.